Pesticides are intended to be harmful. They kill pests, diseases and weeds. But some also harm humans and wildlife. Pesticides are a huge global business, worth around US$45 billion. Each year, 3.5 billion kilogrammes of pesticides are applied to food crops and their use is growing. Much use of this use is at best ineffective and at worst outright harmful. In recent research we showed that farmers in Asia and Africa have been able to cut the use of pesticides while boosting crop yields, reducing costs and delivering healthier profits. Even the landscape surrounding the farms benefits. Each kilogramme of pesticide used in agriculture imposes €3-15 (US$4-19) of external economic costs on the environment, wildlife and human health – money spent by water companies to remove them from drinking water, for instance, or the loss of valuable pollinating insects. Any reduction in use, therefore, saves farmers costs, but also benefits the wider economy too. Cutting out pesticides can be a no-brainer. All pests have some natural predators and parasites and for farmers these are often free. Farmers can build their use into farm management and minimise or even replace synthetic pesticides. This is known as integrated pest management (IPM), an approach focused on manipulating the crop ecosystem rather than simply wiping pests out. Through these farming strategies crop yields can be increased while reducing pesticide application and costs. Farmers get more and the environment wins too. Other research is increasingly showing that sustainable approaches in agriculture can both increase yields and improve the environment – whether the focus is management of soils, water, trees or livestock. 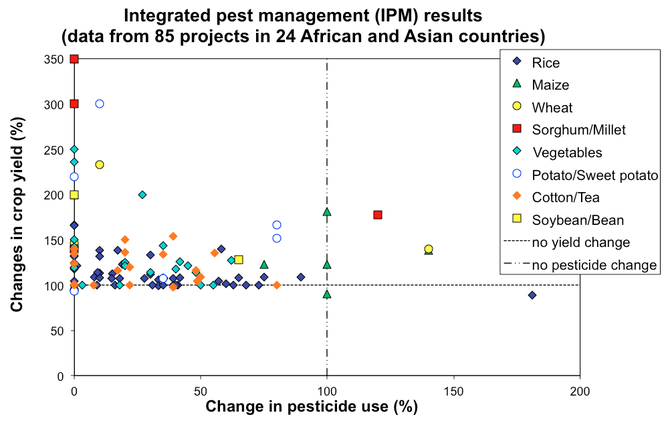 In our research, we analysed 85 IPM projects from 24 countries in Asia and Africa that were implemented over the past 20 years. We wanted to assess their productivity and reliance on pesticides. Across all the projects we found yields were up by an average of 41% over periods of 1-5 years after project implementation, while pesticide use went down by 69%. This goes against the conventional assumption which states that pesticide use and yields are positively correlated – as one goes up, so does the other. Our results show otherwise. Most cases we assessed fell firmly into the top-left section of the below graph where pesticide use falls and yields increase. Cutting pesticides appears to work. The most significant innovation has been the deployment of farmer field schools (FFS) to spread IPM. These outdoor schools, which are run on principles of ecological education and learning through experience, don’t just teach farmers about new technology. They also boost ecological knowledge, problem-solving skills and teach farmers how to use their political strength. FFSs have been set up in 90 countries and there are huge numbers of graduates: 650,000 in Bangladesh, 930,000 in Vietnam and 1.5m in Indonesia. Some 20,000 FFS graduates worldwide are now running schools for other farmers, having graduated from farmer to expert trainer. 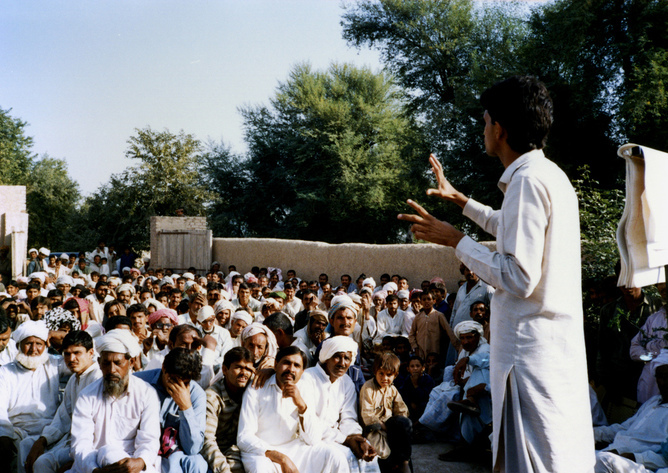 Training Pakistani cotton farmers in pest management. Across the 24 countries and 85 projects we assessed, various different methods were employed to achieve these results. In the irrigated rice fields of Vietnam’s Mekong Delta, predatory beetles are excellent pest-controllers, but are killed when sprayed. Research showed insecticide applications in the first 40 days of rice planting were counter-productive. Two million farmers therefore adopted a “no early spray” rule, which saved money and reduced pesticide use by more than half. The melon fly is one of Bangladesh’s biggest pests. Rather than just spray the watermelon fields, simple pheromone traps were created using a male-scented lure in a recycled plastic jar or bottle with a small amount of insecticide. The results were spectacular: yields have risen 40-130% within 2 years, while insecticide use fell from 15 sprays per season to zero, meaning a healthy boost in profits. Clever behavioural manipulation can also make some cropped areas unattractive to pests. In Kenya, the push-pull system design – vutu sukumu – means farmers mix maize with legumes and plant grass varieties on field borders. The maize pests are pushed away by natural chemicals released by the legumes, while their predators are pulled in by the natural chemicals produced by the grass borders. As it happens, the mix also suppresses the invasive and parasitic Striga, better known as witchweed. the UK (down 44%), France (down 38%), Japan (down 32%), and Vietnam (down 24%). Some pesticide manufacturers have even appropriated the FFS model to promote greater use of their products. There are good reasons for such push-back: in some countries local markets for pesticides have collapsed, such as in East Java in Indonesia. IPM has remarkable potential but the job is never done, so investment in research and development must continue in the long term. Ecological and economic conditions change; climates change too. Pests, diseases and weeds evolve, new pests and diseases emerge (often because of pesticide overuse) and pests and diseases are easily transported or are carried to new locations, often where natural enemies do not exist. In just the past few years we have seen the emergence of the banana leaf roller in India and Nepal, the invasive cassava mealybug in south-east Asia, cucumber mosaic virus in Bangladesh, tomato yellow leaf curl virus in West Africa and cassava mosaic virus and brown streak virus in Uganda. Each requires rapid and co-ordinated action. But working with nature’s services – rather than against them – offers new routes to success. We have shown that millions of small farmers across Asia and Africa using IPM packages can deliver substantial reductions in pesticide use coupled with increased yields. Reduced reliance on synthetic pesticides delivers a range of on and off-farm benefits, including savings, improved public health and improved natural capital on and around farms. Yet, IPM, like other forms of sustainable intensification of agriculture, is much more than just a set of technologies. It is knowledge-intensive, builds social capital and so contributes to society too. Jules Pretty is Professor of Environment and Society and Deputy Vice-Chancellor at University of Essex. Zareen Pervez Bharucha is Senior Research Officer at University of Essex. Progress in the Rainforest. On bigness, smallness, and the business of setting standards.